Always attention to detail, technical skills, passion in our work and great attention to customer needs are the strengths that have allowed us to excel in the field of sale of 6 BRUSHMARKER Winsor & Newton - RICH TONES. Consultando il catalogo di Aerografando you will immediately notice how vast it is and how diversified the model range is KIT PROMARKER - BRUSHMARKER, you will find the best 6 BRUSHMARKER Winsor & Newton - RICH TONES offers at the best prices on all 6 BRUSHMARKER Winsor & Newton - RICH TONES of the brands Winsor & Newton. The BrushMarker are Professional-based alcohol markers that can be used on many types of surfaces, not only on paper! The BrushMarker have two built-in tips, brush and a chisel. The brush is perfect for details and more precise contours, while the chisel tip is great for quick sketches and to fill larger areas. Using the edges of the chisel tip, you can also get a variety of line widths. The BrushMarker colors have a translucent quality and can be overlaid to obtain a depth and opacity variables. Reviewing the same area, you get a darker shade of the same color, this allows a versatile range of shading effects. brilliance and hue variation. Unlike normal tip pens felt, the color of BrushMarker is perfectly smooth, without unsightly smudges. You can overlay different BrushMarker colors to create new colors and, depending on how much ink is wet, you can get smooth gradations. The range includes a special colorless Blender BrushMarker that can be used to soften and blend the colors. For best results use BrushMarker with heavy paper or cardboard coated with a smooth surface. Read the reviews of our customers on 6 BRUSHMARKER Winsor & Newton - RICH TONES of the category KIT PROMARKER - BRUSHMARKER. With us you will find only satisfied customers, thanks to a technical assistance made by those who really know the world KIT PROMARKER - BRUSHMARKER. Review 6 BRUSHMARKER Winsor & Newton - RICH TONES of the brand Winsor & Newton. 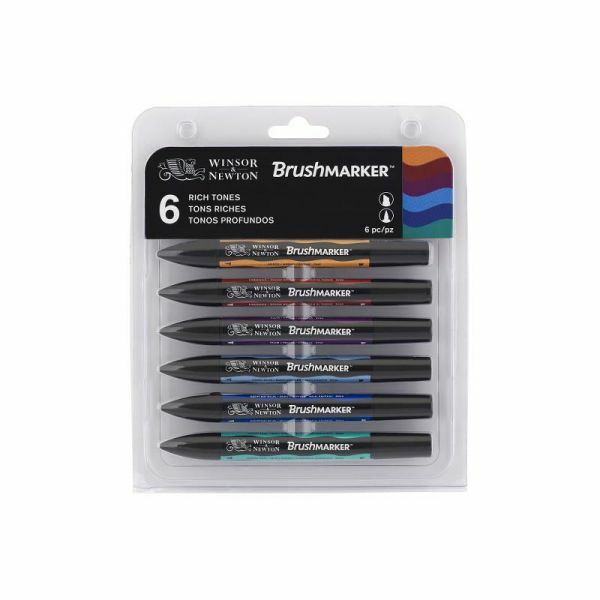 Trust in the quality and professionalism of Aerografando on the sale of 6 BRUSHMARKER Winsor & Newton - RICH TONES, only from us you will find the best prices. You want to have more details on 6 BRUSHMARKER Winsor & Newton - RICH TONES 0290034 or more generally on ours KIT PROMARKER - BRUSHMARKER? You are looking for a KIT PROMARKER - BRUSHMARKER but do not you find it in the catalog? Staff of Aerografando will answer all your requests.